In the Soviet Union there were rare individuals who fought for human rights, at great personal expense. 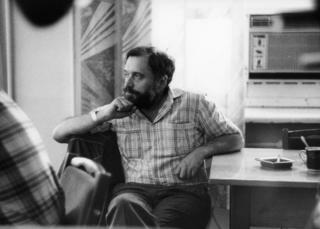 One was psychiatrist Semyon Gluzman, who condemned the incarceration of dissidents in mental hospitals. The BBC’s Owen Bennett Jones met him once in the 1980s and again this year – and this time he was full of hope for the future of his country. It all began when I told my tutor at the London School of Economics that I and a fellow student were planning to travel around the Soviet Union by train. I studied the documents on the train from London and then, when I got to Vienna , took advantage of a 30-minute break to dump them in a platform dustbin. I went for a wander and then as I returned to the train glanced at the bin. The documents had vanished. Anxious, we pressed on. In Kiev, each apartment block looked the exactly same – we had to ask for help repeatedly, each time fearing someone would call the police, but eventually we reached Gluzman. He was a sorry sight, with sunken cheeks after a hunger strike, and the still-shaven head of a prisoner. We delivered the message of encouragement and left. From time to time I have wondered what happened to Semyon Gluzman. And now I know. After I recorded a radio programme in Kiev recently, one of the panellists – an MP – asked if I had ever been in the country before. “Thirty-five years ago ago,” I said. “Yes, of course. He is very well known,” she said, scrolling through the contacts on her phone. The next morning a much fuller-faced Semyon Gluzman was in my hotel lobby. We sat by a window – outside there was ice on the ground and flurries of snow in the air. He told me about his time in prison and exile and about the time the famous dissident, Andrei Sakharov, had come to meet him in Kiev in 1971. “Do you remember our meeting in your apartment?” I asked. “No,” he said. And then, sensing my disappointment, added: “There were many meetings. Maybe 90% were people sent from American synagogues. They thought I was a refusenik.” The term referred to Soviet Jews who wanted to go to Israel but were refused permission. “No, you are a difficulty for me,” Gluzman replied. Irritated by well-meaning foreign visitors misunderstanding his stance, Gluzman eventually wrote a letter asking that no more be sent to see him. “I can criticise the president without punishment,” he said. “And I have hope. When I was in prison I noticed that around 30% of the prisoners from the Soviet Union were Ukrainians. Why, I don’t know.